Ransomware, when it infiltrates an organization, causes most of its damage to user endpoints (laptops, tablets, and smartphones). Endpoints typically make up more than 60% of impacted data. The problem is those endpoints are often the most exposed because they are the least likely to be consistently protected. Those endpoints have an increasing amount of unique data on them that is not adequately backed up. Ransomware is just part of the problem, user error and malicious insiders account for a considerable amount of data loss. External and internal threats to data combined with the increasing amount of unprotected unique data on endpoints mean that organizations need to reconsider their endpoint data protection strategy. The problem is that in many organizations, endpoint data protection is an ad-hoc process and is not adequately defined by IT. The reason? Most endpoint backup solutions start as consumer solutions and treat the enterprise as an afterthought. IT needs a solution that is designed from the ground up to provide enterprise-class endpoint data protection. 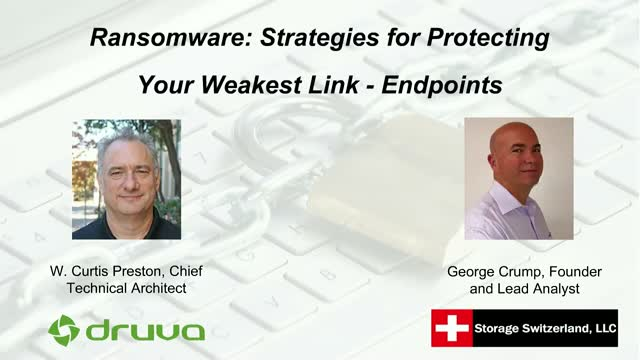 Join George Crump, Lead Analyst at Storage Switzerland, and W. Curtis Preston (a.k.a. Mr. Backup), Chief Technical Architect at Druva for a live webinar to learn the latest strategies for protecting your organization from a Ransomware Attack.